Ring News 24Boxing News Breaking Boxing NewsCan Amir Khan ever reach his former heights? Can he become a world champion in the Welterweight division? 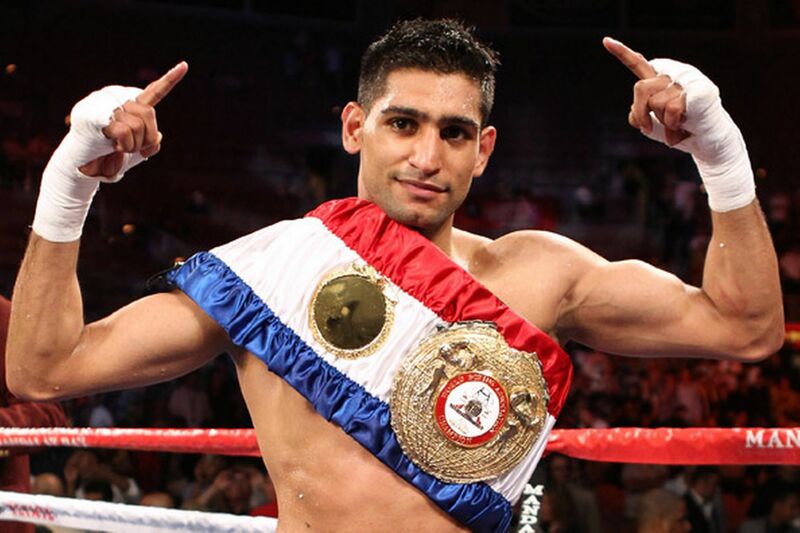 Amir Khan is back and ready to take the welterweight division by storm! Yes, the Bolton boxer has returned after a stint on UK celebrity TV to try and regain his status as one of Britain’s most talked about boxing talents. Amir has returned to British shores after signing a three-fight deal with Matchroom Boxing. Presumably at some point that will include a money-spinning grudge match with Kell Brook that has been simmering over the past couple of years. I interviewed Amir in Las Vegas a year ago (minutes after Carl Frampton had lost in his rematch with Leo Santa Cruz in fact) and he said that once Kell Brook had taken care of his mandatory contender for the IBF welterweight crown then he would be ready to engage. Of course this was a little disingenuous from Amir seeing as Brook’s obligation was to fight none other than Errol Spence Jr who dethroned Brook and sent him into a period of inactivity and uncertainty. Brook is now up at light-middleweight but Khan has previously bulked himself up to middleweight so should be able to do what’s required to make that fight happen. Khan will plot a new route alongside Eddie Hearn now and that schedule sees him return to the ring in Liverpool on April 21, the same night as Frampton boxes in Belfast against Nonito Donaire, so it promises to be a bumper night for UK boxing but also stings of frustration that fans will once again have to split themselves between two events on the night. “I’m thrilled to be teaming up with Matchroom, I’m determined to win another World Championship and I’m confident I’ve got the right team behind me to help me do so,” said Bolton man Kan.
April 21 is likely to be a rust-shedding exercise for Amir and that is indicated by some of the names of potential opponents that have been floating around. Recovering from an injured hand has been taking up most of his time over the past year or so but workings behind the scenes around a possible fight in Pakistan were ongoing, but nothing came to pass in that respect and Khan has instead entrusted his career to Hearn for the foreseeable future. A potentially explosive fight across enemy lines with India’s Vijender Singh had been talked about, but was it ever realistically on the cards? Vijender certainly thought so. “I’m ready to fight him anytime anywhere and it’s not like that. It’s boxing after all at the end of the day. If I can beat him, then what next?” Singh said in the Hindustan Times. which of course has never materalised. Khan will be hoping that this homecoming goes better than the last time he set foot on British soil in a boxing capacity and was dropped and hurt on more than one occasion by Julio Diaz in Sheffield, 2013. That’s one thing you can always say about Amir, for all of his talent, his talking, his celebrity appearances in the jungle, he has consistently provided exciting fights for the fans given his gung-ho style and defensive vulnerabilities. When Khan gets the timing back and the lesser foes out of the way, who will he chase down for a piece of 147lb silverware? It’s hard to gauge who will still be active at welterweight and holding a title at the end of 2018/beginning of 2019 when Khan is likely to be mixing with the elites, but Eddie Hearn likes a bit of the IBF or WBA belts so Khan could find himself in line for one of those. Errol Spence Jr currently holds the IBF and would present an extremely difficult proposition for anyone. Keith Thurman holds both the WBC and WBA belts but he has been injured and inactive so it’s conceivable that Keith may at some point drop the belt bling and disappear up a mountain somewhere, leaving the mice below to fight for the scraps. Jeff Horn holds the WBO title but Eddie does not traditionally push his fighters down this route -leaving that for promotional rival Frank Warren- and Bob Arum will be eager to serve Horn up to Terence Crawford when he starts picking off title holders at welter. I have no doubt that Eddie will be able to secure his new signing a title shot somewhere and at some point in the future.